The inset onyx stones on this cross remind us that death has no victory over the cross, but Christ overcame it and rose to everlasting glory! Made with genuine, high quality black onyx stones set in 14K solid yellow gold. Cross Dimensions : 1 by 3/4" (measurement does not include hoop/bale). Also available in 18K Gold or White Gold or large size. 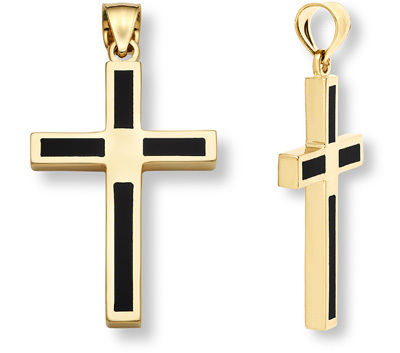 We guarantee our 14K Gold Onyx Cross Pendant to be high quality, authentic jewelry, as described above.